This meeting’s scientific programme offers a wide scope that will be of interest to general practitioners, cardiology trainees, respiratory medicine trainees, haematology trainees, consultant cardiologists, haematologists, nurses, health professionals with an interest in pulmonary hypertension and pulmonary embolism and researchers in the field. Registration for this meeting is free of charge for UK residents. 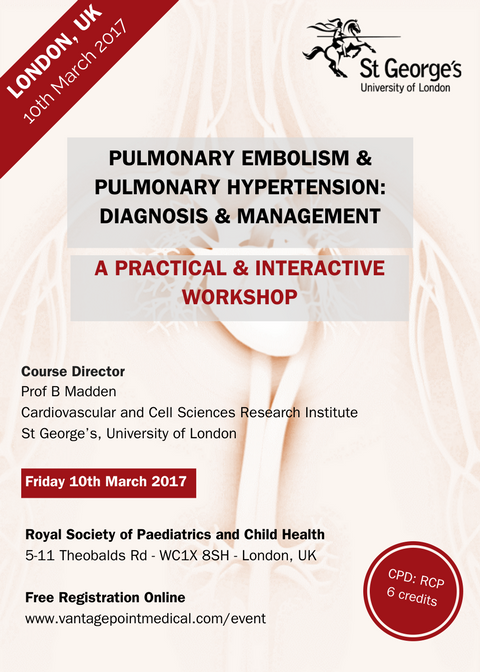 ‘Pulmonary Embolism & Pulmonary Hypertension: Diagnosis & Management – A Practical and Interactive Workshop’ has been approved by the Federation of the Royal Colleges of Physicians of the United Kingdom for 6 category 1 (external) CPD credit(s). All sponsors have provided a sponsorship grant to support this meeting and have had no input into its content. © 2019 Vantage Point Medical. All Rights Reserved.